Here you see two oranges captured by an industry-oriented test setup with a "Spectral Eye" (wavelength region 950 - 1700nm) of the German company Inno-Spec. The right orange is a healthy one while the left one has some bruises. By human eyes these defects are not visible but the chemistry of healthy regions, bruises and stems can be interpreted by Chemical Color Imaging. 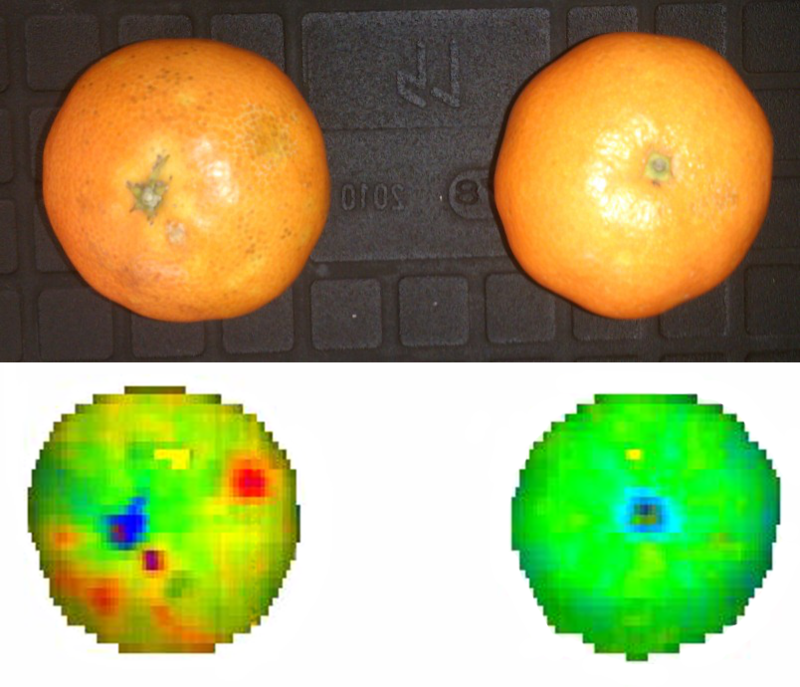 Based on these Chemical Colors the customer's image processing system can decide affected oranges should be treated. Maybe they are sorted out, maybe they channeled to a lower grade. The Perception of the month June shows the possibility of differentiation between various pepperonis. Chemical Colour Imaging allows to differentiate between healthy apples and affected ones.